Now offering innovative, safe, and effective hair restoration treatments, the hair loss treatment center of Dr. Hedi Belajouza in Tunisia extends the boundaries of technology on many levels. The VisitandCare.com dedicated hair loss provider is devoted to the art and science of hair transplantation. By partnering with the top medical providers, we’re fueling growth at the upper reaches of the medical tourism industry. Now offering innovative, safe, and effective hair restoration treatments, the hair loss treatment center of Dr. Hedi Belajouza in Tunisia extends the boundaries of technology on many levels. Perfection to the last detail — meticulous hair placement, artistic shape of the hairline, and the seamless location of the harvested follicle — are all results in exceptionally satisfied patients. This pursuit of perfection is predominantly visible in the artistry and talent of Tunisian hair transplant surgeon, Dr. Hedi Belajouza. 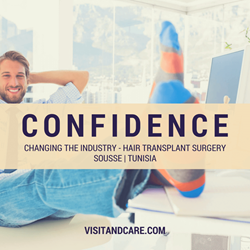 Partnered with the leading medical tourism agency, the Tunisian provider has become the most advanced hair transplant clinic in Sousse — and a scientific spearhead for hair loss in men and women. Using state-of-the-art surgical advancements in hair transplantation, the clinic offers Follicular Unit Transplantation (FUT), Follicular Unit Extraction (FUE), strip surgery scar repair, and eyebrow and beard transplants. In the U.S alone, hereditary hair loss affects approximately 30 million women and 50 million men. Two-thirds of American men report some degree of hair loss and thinning by age 35. After the age of 50, 85 percent report a significant degree of hair thinning or hair loss. Nearly 40 percent of women have visible hair loss by the age of 40. Overwhelmingly inspired to help the patients represented in these statistics, Dr. Hedi Belajouza has committed his career towards the extensive study of hair restoration. This unwavering commitment has led to the achievement of consistent, predictable and dependable results with each and every hair transplant surgery performed in Sousse. Hair transplantation is an extremely delicate surgical process and every patient’s hair thickness, thinning location, and expectations vary. These differences are what dictate the best treatment plan for individual hair transplant surgery in Tunisia. The VisitandCare.com dedicated hair loss provider is devoted to the art and science of hair transplantation. The entire staff is attentive, understanding and exceptionally sensitive to patients' needs and has extensively trained and continually participates in the latest developments in the field of cosmetic hair restoration. “By partnering with the top medical providers, we’re fueling growth at the upper reaches of the medical tourism industry. Record revenue growth and strong patient-focused approaches has honed our competitive edge in the industry. As a whole, our company is the early stages of a high-volume position that will take the brand to its highest year on record,” stated Tolga Umar, CEO and Founder of VisitandCare.com. VisitandCare.com was created to give individuals worldwide valued direction locating a doctor, obtain free medical treatment quotes, and uncover affordable medical treatments at destinations of their choice. Improving Patients Lives | The company provides access to exclusive doctors and hospitals who specialize in infertility, plastic surgery, cosmetic dentistry, laser eye surgery, orthopedic surgery, hair transplantation, weight loss surgery, heart surgery and cancer care. Patients are matched with devoted multilingual patient facilitators and provided tangible connections to doctors worldwide. Promoting Your Healthcare Brand | For the ultimate connection between the healthcare industry and patients worldwide, the company delivers an unrivaled commitment to create sustained value for medical partners. Contact VisitandCare.com to see if you are eligible to become a partner of our exclusive network.